I've got Week 17 ready to share today. Currently I'm about 3 weeks behind and desperately want to get caught up. Last year at this time I begin to get behind....really behind, like 17 weeks. I don't want to go there again. I'll be sharing some of my time saving tips at the end of blog posts. Hopefully you'll find some helpful tips to keep you on track. Here's my 2 page spread for Week 17. 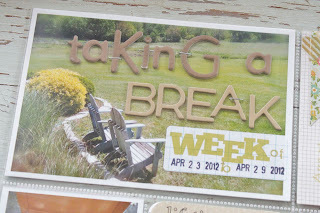 This week was all about taking a break from our hectic schedule. Josey developed a severe case of shin splints and was given doctor's orders to take a 2 week break from running. Jordan didn't have any meets this week either so there was some nice downtime. 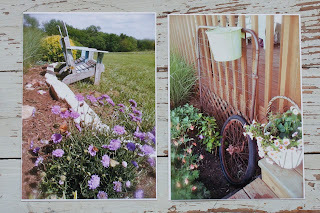 Always busy planting flowers and tending to the gardens at this time of year. New growth, new beginnings, new baby kittens. Here's a look at my 4 x 6 inserts. Instead of devoting a full insert for a title block I've started to select a photo that sets the theme for the week. 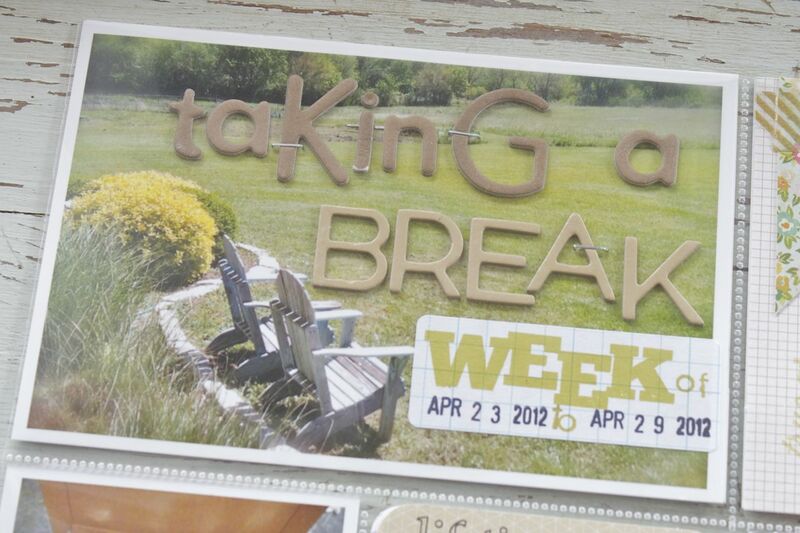 My old lawn chairs were perfect with my chipboard titles. Stamps are from Studio Calico on my Grid Labels from the shop. Smaller typed labels, a hand cut flag and Waship tape. More stamps from Studio Calico. Here I used a Project Life plain grid journaling card and topped it with patterned paper and some Ali Edwards stamps from Technique Tuesday. More washi tape layers on top with a little machine stitching. 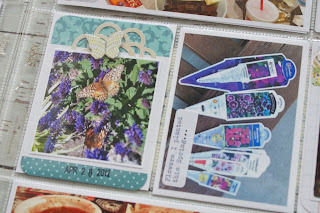 Here I used a Project Life bi-fold journaling card. 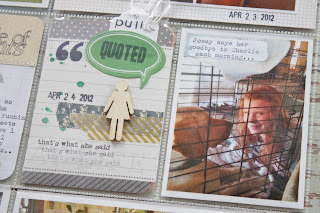 I like to embellish the outside, here I used washi tape layers, a Studio Calico wood veneer girl, a SC quote sticky and SC stamps. I used a Medium White Tag for a stamped pull out tab. 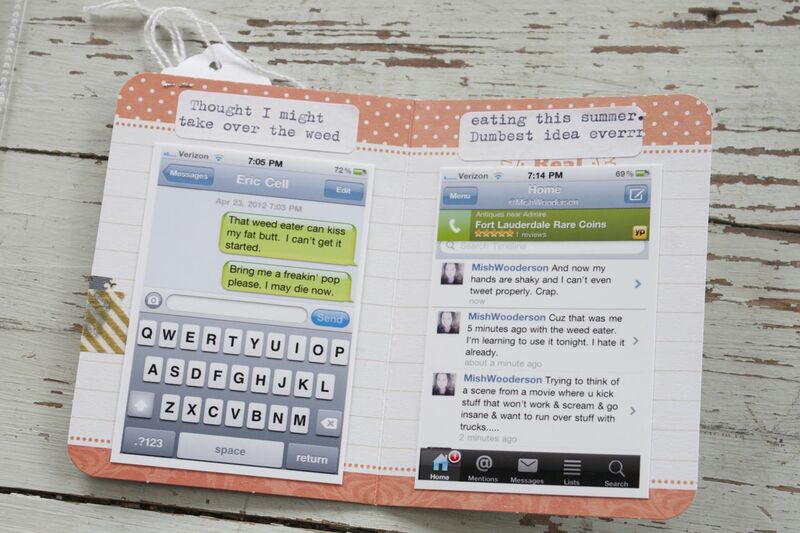 Here's the inside of the bi-fold journaling card with my frustrated texts and tweets about weed eating. 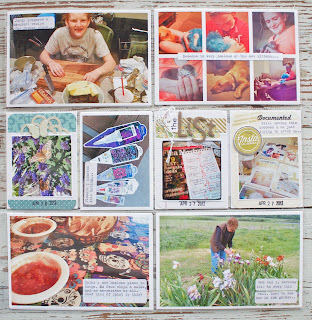 More 3 x4 inserts. I've been including lots of photos in these slots as there's just a lot going on lately. 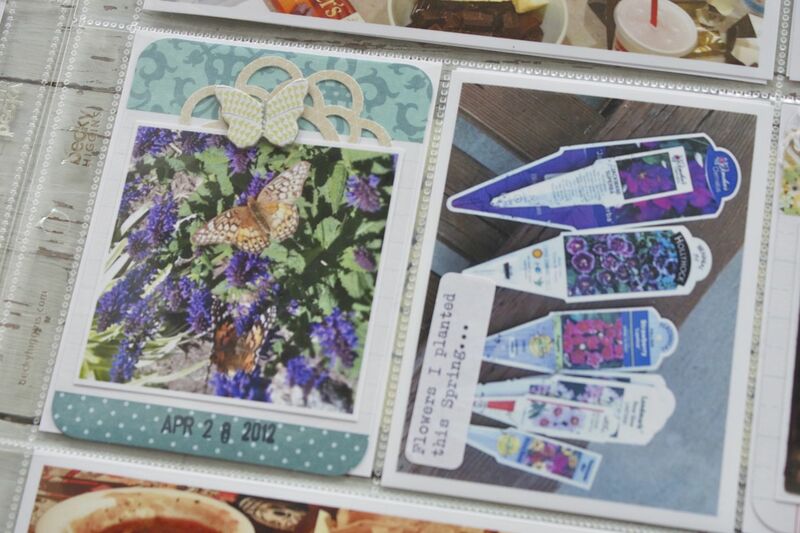 On the left I used a Project Life journaling card with the photo adhered right on top. One of my favorite set of 3 x 4 inserts. 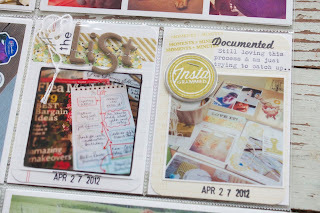 On the left I created a fun "list" title using chipboard letters and little snippet of a Small White Tag. On the right I used a Metal Rim Tag with the much loved instagrammed stamp that Kelly Purkey created for Studio Calico. It punches out perfectly to fit on my metal tag. I stapled my metal tag right to my journaling card. 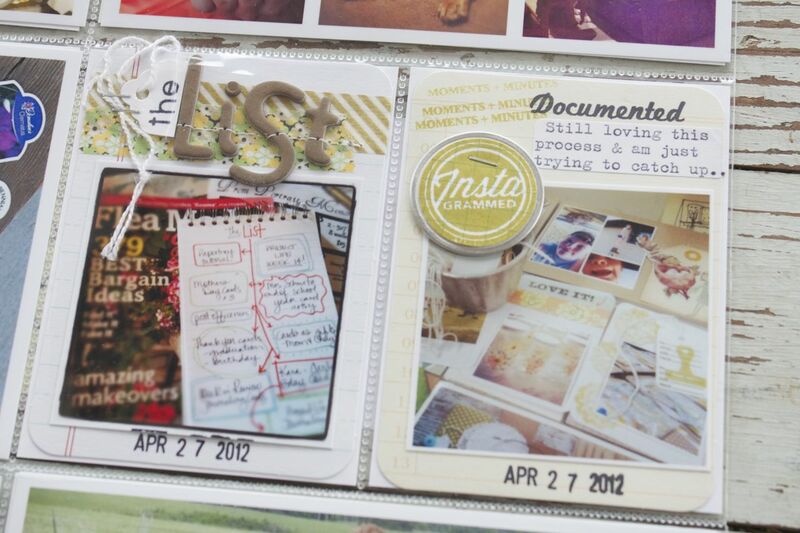 I love that it stays fairly flat versus a button or badge that adds more bulk to my album. This is a good thing especially if you're trying to keep the number of albums you need per year to a minimum. 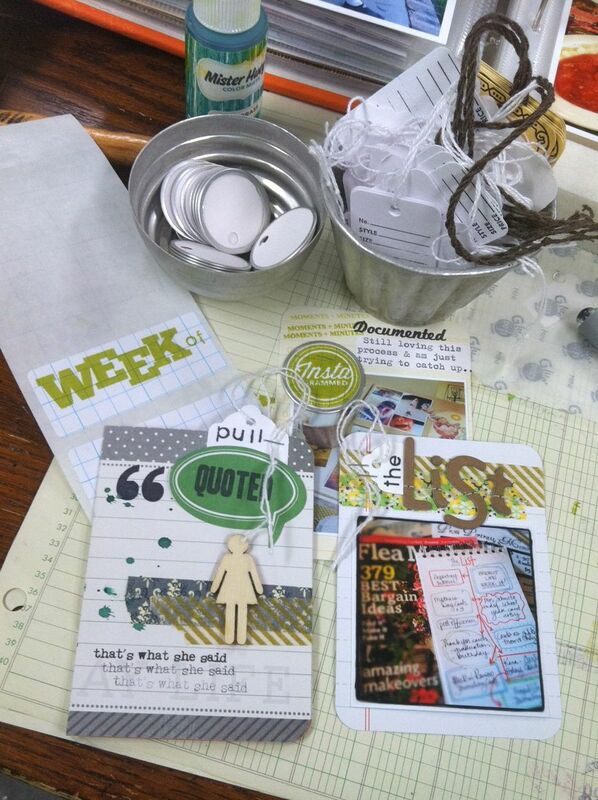 Tip: Another thing I've started doing is adding in inserts that I'll go back and finish later. Here I've selected 2 of my favorite photos from the week from around the yard. I printed them at home (Epson Artisan 730 and it's awesome!) and tucked them into a page protector. I can leave them as is as showcase photos or I may go back later and create 8.5 x 11 back to back layouts. 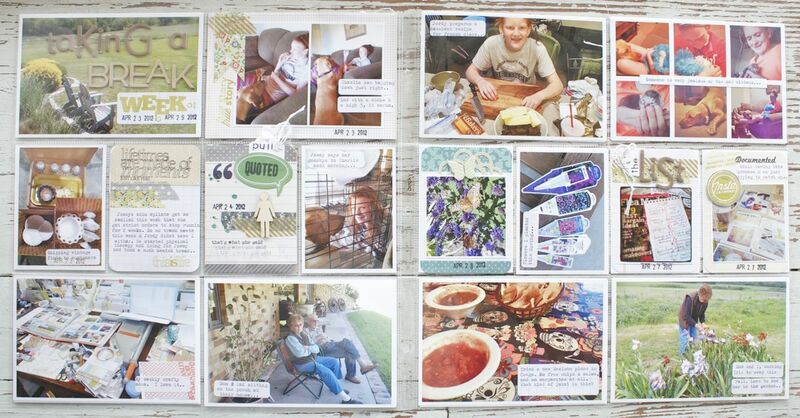 Either way the photos are printed and tucked inside this week's spread. It's a great way to show off your best photos. 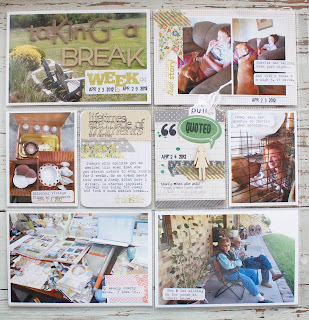 More tips: Here's a recap of my best time saving tips for this week. Labels that I can run through my typewriter are a lifesaver. 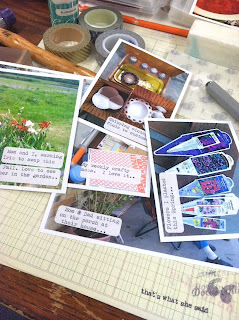 This week I used small labels, my Grid Labels and my brand new Notebook Paper Labels. Washi tape. It's so easy to just rip off and adhere to the inserts. 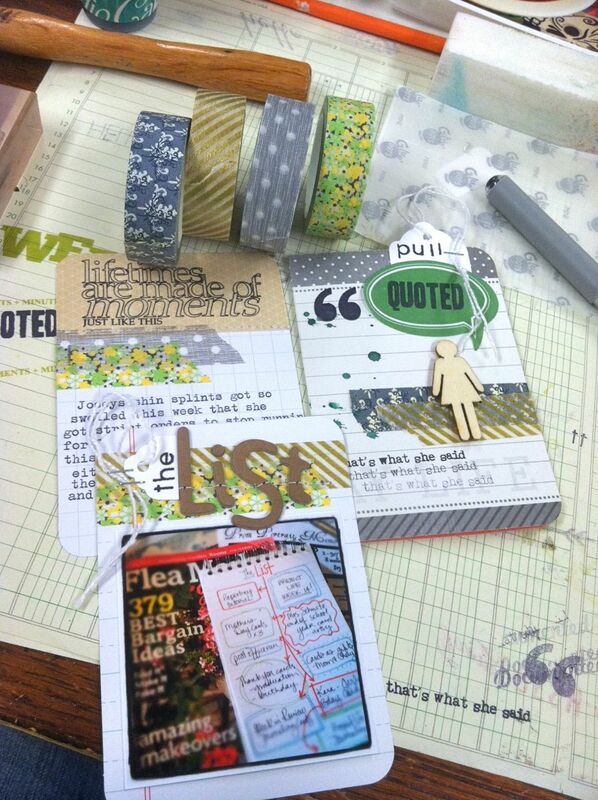 You get instant color and pattern without having to drag out a lot of patterned paper. This Silver Metallic has become a new favorite and I'll more in the shop probably this week. Tags of all kinds. I have oodles of varieties in the shop and use them on every weekly spread. They're great for making pull out tabs, little journaling pieces, embellishments, etc. 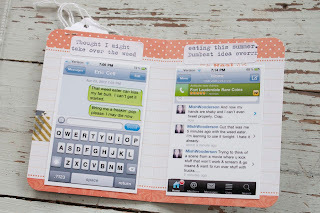 There's no die cutting involved so they're quick and easy. I love how they add detail without adding a lot of bulk. My favorite this week was the metal rimmed tag. And that's it for this week. Stay tuned for more completed Project Life spreads coming this week + a shop update with new Washi tapes, tons of sacks and new items coming this Summer. Thanks for stopping by! 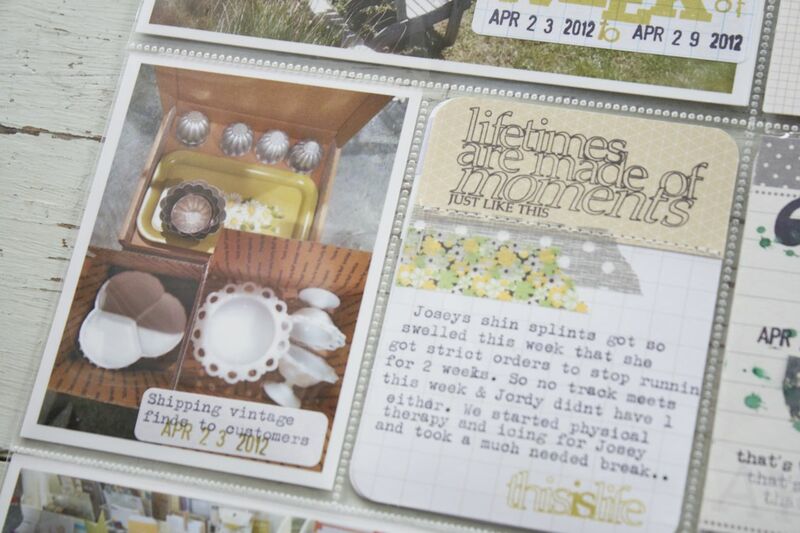 great tips, love all the different embellishments you have! Great post today!! I love to savor your posts with a good cup of coffee. Your yard looks so inviting...Thanks for sharing. Hi, I am new to your blog and I have a question. 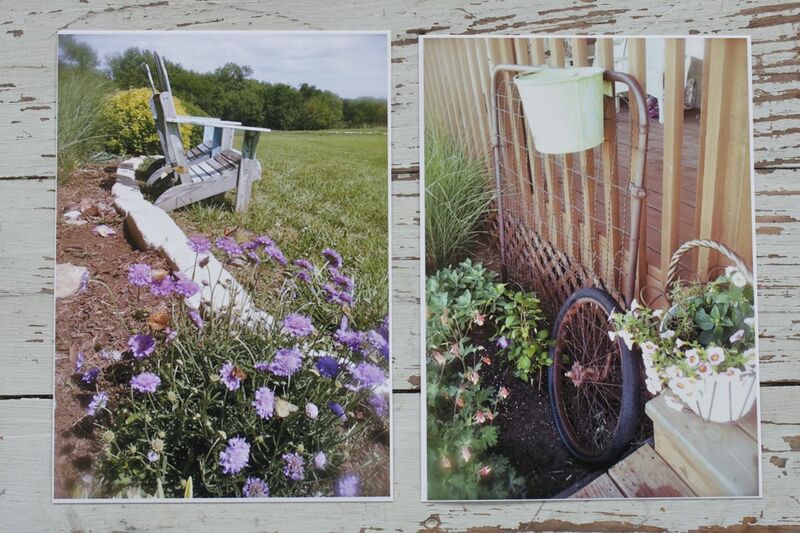 Do you send your photos out for printing and get that white border around them? 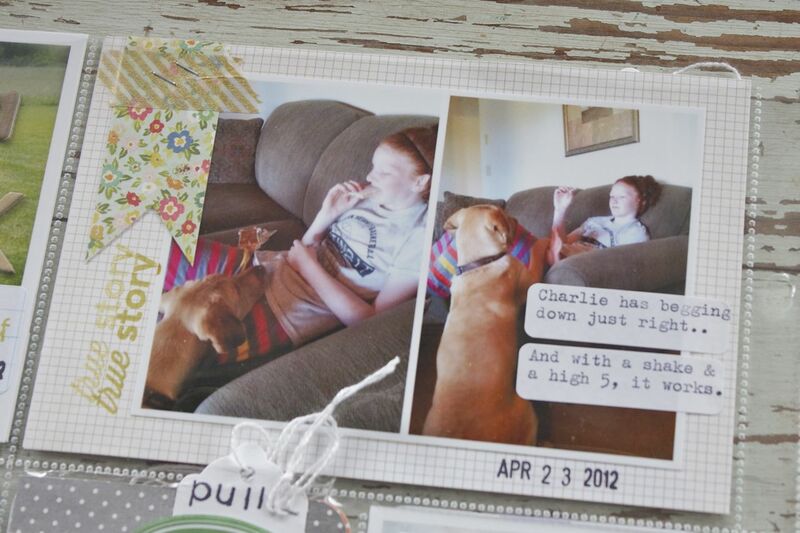 Or do you print at home with a program that puts the white border around them? Thanks! 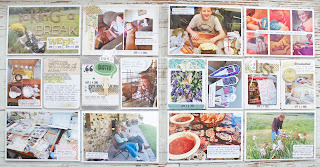 Love your project life pages! I love Your PL. It's so cute and the tips are so helpful. I feel like I pull out every think but the kitchen sink when I work on mine. I wanted to know more about your printer. Does it us ink like crazy? How long have you had it? Do you mainly print 4by6 and smaller? 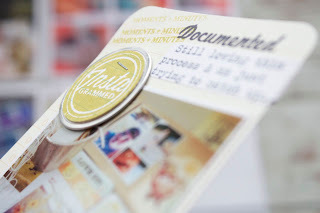 Are you in love with the print quality and what photo paper do you use? I would love a reply and thanks for sharing. Love love love your pages today!!! I look forward to your Project Life updates. Sorry to hear about the shin splints for Josey. Hope she heals up soon!